This was totally different from what I usually eat and I loved it! It's almost a honey mustard flavor slaw, with the sweetness of apple and the protein included as well. A great one-dish meal for the warmer weather. Mix mustard, ACV and stevia in a container large enough to hold the other ingredients. 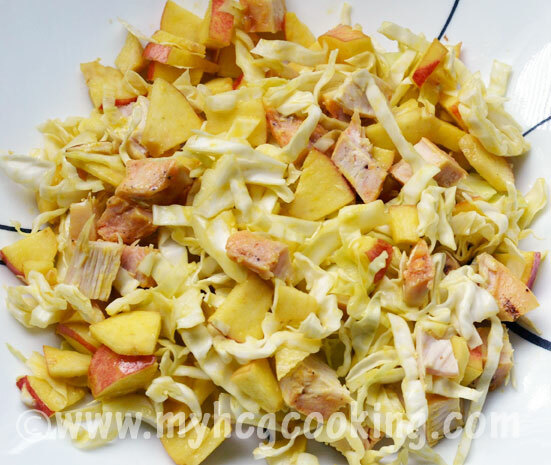 Add cabbage, apple and chicken and toss to coat. Eat immediately or refrigerate for later. I'm eating this now for my lunch and it is AWESOME!! Made it early this morning and it has been in the fridge...crunchy, sweet, tangy....great recipe! Is the chicken in this recipe just grilled and lightly seasoned with salt and pepper? I didn't have any cabbage left on hand so I did this with romane lettuce instead. Grated the apple and absolutely loved it. This will become my quick summer salad fix forsure. Thanks! I am in love with this recipe! Love it! Thanks so much for sharing...7 yrs ago!